There is so much to see and do around Lake Pochard Holiday Lodges that this makes a great base for a family holiday, or for relaxing and exploring the beautiful Cotswolds. Lake Pochard Holiday Lodges are situated on the Cotswold Water Park, near Cirencester, the capital of, and gateway to the Cotswolds. The area is renowned for its picturesque scenery and stone built villages. There are numerous National Trust and English Heritage properties offering stately homes, gardens, walks and Roman antiquities. 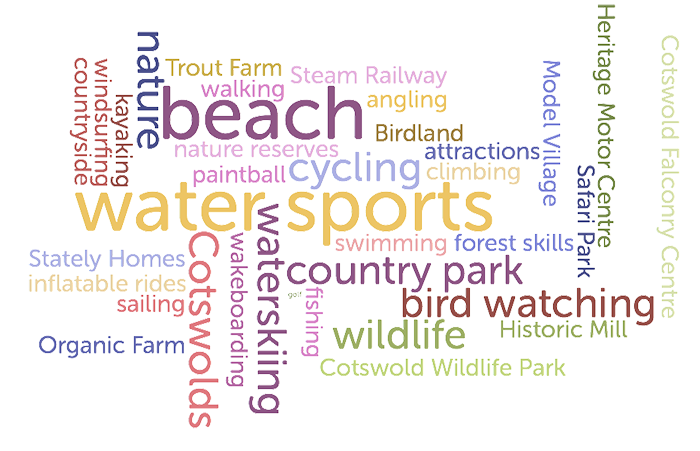 The Cotswold Water Park is much much more than ‘a park’ ! It is an area of 40 square miles and 150 lakes, with many different leisure providers, and many different places to stay. Since 1967, when the whole area was designated as ‘the Cotswold Water Park’, it has grown to become a major tourist destination in its own right – more than 500,000 visitors come here every year. The area offers a wide range of water activities, miles of footpaths and the national cycle path runs right past the Waterside Cafe. The mixture of warm and wet weather is expected to provide stunning autumn colours at Westonbirt Arboretum this season (19 miles from Lake Pochard). The best time to visit is from September to mid-November when colours are at their best, although with its 14,000 labelled trees and 17 miles of accessible paths, Westonbirt Arboretum is a joy to visit all year round. 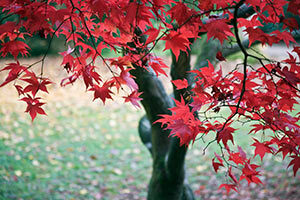 For more information see Westonbirt Arboretum. The Cotswold Water Park has a wide variety of water activities. Try your hand at sailing, kayaking, swimming, waterskiing, inflatable rides, wakeboarding or windsurfing. Cotswold Country Park and Beach, formerly known as Keynes Country Park, is the largest inland bathing beach in the UK. The area is open from March to December. Activities include the WIBIT AquaVenture, open water swimming. boat and kayak hire and paddle boarding. A military style paintballing attraction for aged 10 and over. Open 7 days a week. The country lanes and off-road cycle routes make the Cotswold Water Park a great place to cycle. The National Cycle Route 45 runs alongside the Waterside Cafe. Bicycles can be hired from Go-by-Cycle and subject to conditions, can be delivered directly to your lodge. A high ropes activity centre offering a range of climbing, jumping and swinging activities in complete safety. Open to families, individuals and groups with packages from 30 minutes to a full day. Available for all ages. Cotswold Forest School teaches survival techniques such as bushcraft, firelighting, den building and much more. For adults and older children. The Bibury Trout Farm is one of the oldest and attractive trout farms in the country. High quality trout reared to supply angling waters and for fishing by visitors. Gift shop, beginners fishing lessons (summer), fresh and smoked trout sales, and cafe. For Adults and children of all ages. Birdland at Bourton-on-the-Water is set in seven acres of woodland, river and gardens, inhabited by over 500 birds, flamingos, pelicans, penguins and cranes, 50 aviaries, also tropical, temperate, and desert houses. Picnic areas, cafe, gifts and play area. At Butts Rare Breeds Farm there are lots of animals to see and activities to take part in. You will have the opportunity to feed some of the animals, including goats, lambs and pigs, and hear talks on farm life and on each of the animals. Visit the ruins of one of the largest Roman villas in England complete with its famous mosaics. Chedworth Roman Villa is very much an interactive attraction, with many events being staged so that your experience of the site is ehanced and your understanding of the Roman way of life improved. The Dunkirk Mill Centre offers a wonderful opportunity to see a massive working water wheel directly powering a rare piece of historic textile machinery. The overshot wheel, twelve feet wide and thirteen feet in diameter, was installed in the mill in 1855 as part of the last major re-building programme carried out during its time as a woollen mill. It was made and installed by James Ferrabee of Stroud having a mainly cast iron frame with forty steel buckets. Lodge Park, situated on the picturesque Sherborne Estate in the Cotswolds, was created in 1634 by John ‘Crump’ Dutton and inspired by his passion for gambling, banqueting and entertaining. Until 1983 it was the home of Charles Dutton, 7th Lord Sherborne, and, when bequeathed, it was the first project undertaken by the Trust that relied totally on archaeological evidence. Visitors can now experience how the unique grandstand would have looked in the 17th century and enjoy the impressive views of the deer course and park, which was designed by Charles Bridgeman in the 1720s. For adults and older children. The model of the actual village of Bourton-on-the-Water built of Cotswold stone to 1/9th scale in 1937. The river Windrush flows under Bourton’s famous bridges. The beeches, Cherries and chestnuts are all in miniature. Music in the churches and of course the model of the model. Roves Farm is a family run business. The 166 hectare working farm comprises of livestock and arable land. The Visitor Centre, which opened 22 years ago, enables people of all ages to come and enjoy ‘Hands on Farm Fun& Adventures’ with the help of the Roves Farm Team. Located at Bitton Station midway between Bristol and Bath on the A431 one mile from Keynsham. The Avon Valley Railway is more than just a train ride, offering a whole new experience for some or a nostalgic memory for others. The track now extends south to the proposed location of a new platform at the River Avon with the opening planned during 2013. Passengers will be able to enjoy walks in the surrounding countryside, as well as the many attractions the River Avon has to offer. Cotswolds Falconry Centre is for both adults and children. Watch the flying exhibitions of eagles, hawks, owls, and falcons. Appreciate their speed, grace, agility and their close relationship with the falconer. There are many breeding pairs of birds including the owls in Owl Wood. The Falconry Centre is in the same grounds as Batsford Arboretum. Adam Henson’s Cotswold Farm Park is the home of Rare Breeds Conservation. Visitors can meet over 50 flocks and herds of farm animals, including Gloucestershire Old Spot pigs and Highland Cattle. The Touch Barn and Demonstration Barn can be enjoyed all year round and the adventure playground, farm safari, Cotswold Lion maze, tractor school, sand pit and jumping pillows, provide lots of entertainment for children of all ages. Cotswold Wildlife Park & Gardens is located near Burford and is for adults and children of all ages. The Park exhibits over 260 animal species in approximately 160 acres of parkland and beautiful gardens with a fine variety of plants around a setting of a listed Victorian Manor House. Facilities include cafe, picnic areas, adventure playground, narrow-gauge railway, and gift shop. Disabled wheelchair access provided for. The Heritage Motor Centre near Banbury in Warwickshire is the largest collection of historic British cars in the World. There is also the all-new ‘Time Road’ which leads visitors on a fascinating journey through Britain’s motoring and social history, as well as a 1930′s themed motoring cinema and the ‘Get Behind the Wheel’ zone. A real working organic dairy farm in the Severn Vale, St Augustines is a typical dairy farm of over 100 acres where the everyday farm life will go on around you. Watch the cows being milked in a herringbone parlour every afternoon, talk to the farmer as he works and find out where your milk comes from. Help feed the baby calves and visit the farm animals in the paddocks. Follow the farm trail to see over 50 acres and see our wildlife in its natural habitat. Explore the mini woodland trail. Go back in history and discover a vanished era in our bygones collection. The Safari and Leisure Park caters for adults and children with many wild animals to see and drive next to. The children will love the leisure park with many amusements.